Who says beautiful, expansive white sand beaches can't be found in the United Kingdom? 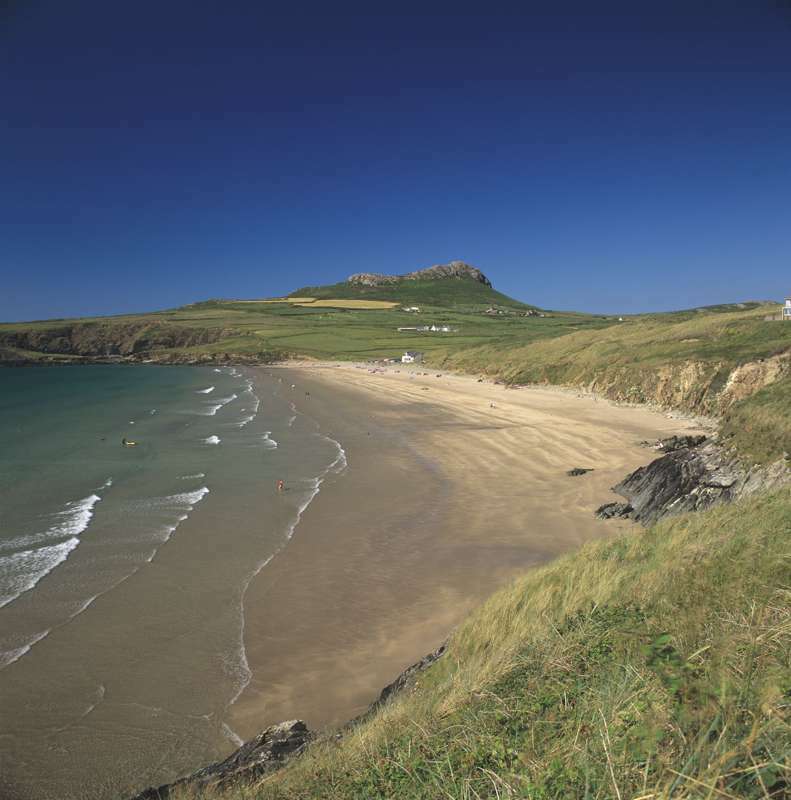 Whitesands Bay is a perfect location for visitors to enjoy on sunny days. The beach is ideal for surfing and throngs with wet-suit clad surfers on winter days as well as summer ones. In 2016, Whitesands Bay received Europe's exclusive Blue Flag rating, meaning the water quality if top notch and visitors can expect a high standard when it comes to the beach, as well as its great amenities. Barafundle Bay is made up of golden sands and craggy cliffs. The beach looks secluded compared to some of the more travelled-to sea outposts. The seclusion is perfect for visitors who want to escape the crowds. To reach Barafundle Bay, flip-flop-clad beach-goers must first complete a one mile walk from the beach's car park. Once visitors get to the sands, though, they're rewarded with crystal clear waters and a supremely beautiful beach. Surfers looking for great waves should look no further than Freshwater West. The waves are for experienced surfers as the currents can be quite strong (though that doesn't stop pretty much anyone having a go most of the time). There are lifeguards in summer. Freshwater West beach has been featured in films in recent years, including Harry Potter and, most recently, Dunkirk. Freshwater West is home to Café Môr food van – the creative food van provides plenty of delicious eats for beachgoers during a day out and has won numerous awards – while, just up the track, there is also a new National Trust-owned campsite. Situated on the southern end of St. Brides Bay, Little Haven is a gorgeous little village for visitors to explore. The village is home to Little Haven beach. The tiny cove is the main site for people to enjoy during a stay. Little Haven is also home to another beach called The Sheep Wash. Visitors to the village can stroll the Coast Path. The 186-mile long path runs along the Welsh coastline. It is a beautiful part of Great Britain to spend a holiday. Newgale beach stretches for around two miles along the Welsh coastline. The sandy beach is surrounded by pebble banks and rugged Pembrokeshire hills. Surfing is one of the most popular activities at the beach. Due to the strong winds, kitesurfing is another favourite pastime, too. The beach is home to a walk-through cave that takes visitors into sheltered bays. Another surfer's paradise, Manorbier beach has some strong currents, so beginners should take particular care. Although surfers of all levels can enjoy the beach, the strong currents make it a surf spot for more experienced riders. Visitors can find a number of cafés and pubs nearby to enjoy a meal or a sunset pint. In addition, nearby Manorbier Castle, overlooking the sands, makes for a worthwhile visit while you're in the area and offers super views down to the sands. Marloes Sands is an expansive golden sand beach with grassy cliffs as the beach's backdrop. Marloes Sands is well-known for the unique rock formations that exist at the beach. Located nearby is Marloes village, which is home to multiple eateries and a good campsite in nearby Dale. Marloes Sands has won several awards in recent years including the Green Coast Award and the Seaside Award. Caerfai Bay is a rocky cove with patches of brown sand. The waters that lap onto the shore are crystal clear and at low tide, visitors can experience the exposed sandy shoreline. The Caerfai Bay car park is free, and there is plenty of parking for visitors when arriving at the beach. After enjoying Caerfai Bay, visitors can travel to St. Davids, one of the most popular spots in Pembrokeshire and the UK's smallest city – it's little more than a village in size but packs a real cultural punch. There are plenty of pubs and restaurants to sample along with the historic 12th century St. Davids Cathedral. Amroth beach is perfect for games and other beach activities. Thanks to its wide sandy shore during low tide, visitors can find an expansive golden beach. Amroth beach was award the famed Blue Flag Beach award in 2016 and the Seaside Award the same year. The beach also has plenty of great amenities for visitors including pubs and cafés selling all types of food and drink. Compared to many of the beaches in Pembrokeshire, Monkstone beach is quite remote. Visitors must go through the Trevayne Farm footpath to reach the beach. Once visitors reach the end of the footpath, they must descend a steep cliff to reach the sands. The path and the steps down to the beach are well maintained. While other Pembrokeshire beaches have facilities and amenities located nearby, Monkstone is quite bare. Visitors won't find any cafés, pubs or restaurants. However, they will find a well-kept beach that is far wilder than others in the county.